The Lady Eagles softball team remained unbeaten in league play with two victories before spring break, improving to 6-0 on the season. They defeated Tech and Sunrise Mountain. Boulder City, 15-3 overall, played several games in California this past Tuesday and Wednesday as part of a spring break schedule. Their next home game is against rival Virgin Valley Tuesday. Mickaela Brown pitched a five-inning one-hitter as the Lady Eagles defeated host Sunrise Mountain 10-0 Friday. Brown and Summer Smith each went 2-for-3 with a double, and Charlene Masterson was 2-for-4 with a double. The Lady Eagles broke open the game by scoring six runs in the top of the third inning. Nikki Schulz was 2-for-3. On April 9, Boulder City beat Tech 12-2 as Brown was 3-for-3 with a triple, a double and two RBIs. Schulz added two hits and four RBIs, and winning pitcher Masterson and Kaila Davis each had two hits. Masterson threw a six-hitter and struck out 11 batters. The Eagles, 11-3-2 overall and 5-1 in the Sunrise League, lost their first league game of the season only days before spring break, but remain in a three-way tie for first place with Tech (10-3, 5-1) and Chaparral (9-5, 5-1). On April 9, the Eagles dropped their first home game of the season and first league game 5-3 to visiting Tech. The loss also snapped a seven-game winning streak for the Eagles. Tech scored game-tying and winning runs on a misplayed fly ball with two outs in the top of the seventh inning. Mario Castanon and Colton Bosnos each went 2-for-4 with a double for Boulder City. On Saturday, the Eagles got back in the win column with a 19-0 victory against host Sunrise Mountain. 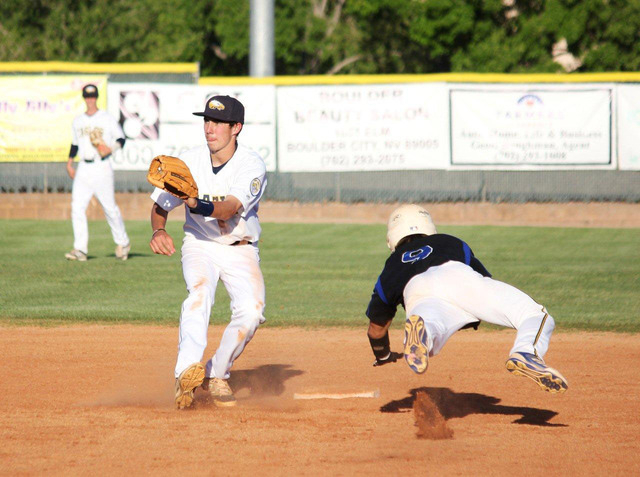 It was the second game within the week in which the Eagles scored 19 runs, having beaten Moapa Valley earlier 19-14. Austin Wishard went 3-for-5 with four RBIs and four runs. Wishard had two doubles and a triple for Boulder City, which scored 11 runs in the sixth inning. Austin Shepard and Patrick Garvin each went 3-for-4 with two RBIs, and Tayler Wold was 2-for-4 with a double and an RBI. Seth Kermode also was 2-for-4, and Castanon added three RBIs. Zach Murphy and Preston Van Diest combined to pitch the one-hitter for the Eagles. They played this past week in San Diego in the Lions Tournament that ends today. The Eagles’ next home game is at 3:30 p.m. Tuesday against Virgin Valley. The boys and girls swim team were off for spring break and return to action April 26 at a trimeet against Eldorado and Foothill. Boulder shot a first round 343 and second round 345 for a 688 total and 12th place in the Pahrump Valley Invitational on April 10. The Eagles did not place an individual among the top 20 finishers. Luke Logan and Marcus Walker lead the Eagles back to the course after spring break with a seven-team Division I-A league match Monday at Wildhorse Golf Club.